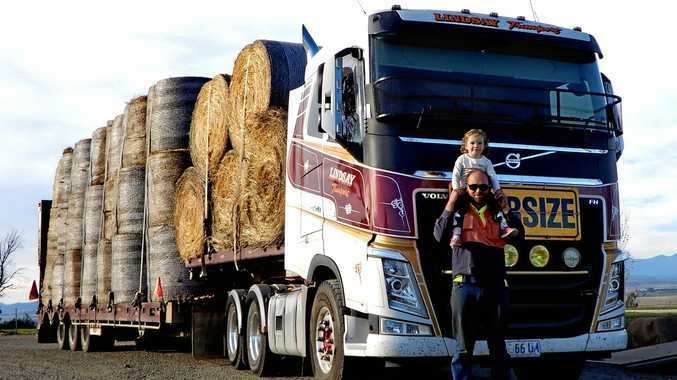 "WELL, you have caught me trying to teach my three-year-old daughter, Annabel, some of the tricks of the trade so she can drive a truck herself one day,” Jono Lindsay, from Cressy, told us the other day when he rolled into the Caltex at Epping Forest. He was driving his 2015 FH Volvo 540 Euro 5, with a drop deck loaded with hay on the back and was on his way from Cressy to Saint Helen's and then return. "It's a family business,” he said. "And we have five trucks on the road at the moment. "You might say I grew up with trucks, and they have always been my life, and happily I enjoy the job too. "We work all over the state, float work and odds and ends but mainly moving hay. "As you can see Annabel enjoys the ride and loves being out in the truck with me and she is great company too. "Her other main love in life at the moment is her pony Chock.